PowerPoint gets blamed unfairly for much of what's wrong with most business presentations--boring, impersonal, unmemorable. The problem isn't with the software, however; it's how it gets used. That's not to say there aren't advantages to putting the slides aside on occasion. But overall there's no better tool for supporting effective presentations. In oral presentations, visual aids can play a critical role. Research suggests that three days after an event, people remember only 10% of what they heard, but 35% from a visual presentation and 65% of a presentation combining both oral and visual. Educational studies indicate that about 83% of learning occurs visually. Visual images can also increase attention levels, aid persuasion, and clarify messages. Don't make the audience read. Keep this fact in mind: People can't read and listen at the same time. Your slides should contain few words. Use short phrases, not sentences. Better still, use simple graphics and pictures instead. It helps to remember that your slides are for the audience's benefit, not the speaker's (i.e., they're not speaker notes!). Stick to one main point per slide. Slides help add structure to your talk, much as headers do in a document. They typically have a title that describes the main point of the slide. When you veer off that topic, the audience can lose focus or become disoriented. The same is true when you linger too long, whether covering too much ground with a single slide or going into too much detail. Keep it simple and to the point. Bring up one bullet point at a time. As a general rule, try to use as few bullet slides as possible. But when you do, don't throw all your bullets on the screen at once. Remember the can't-read-and-listen-at-the-same-time rule? While you're still talking about the first point, many in the audience will be reading ahead. Or tuning out the slide altogether because there's too much information on it. Reveal the bullet points on your slide in sync with your talk. Plan on four minutes per slide. This is a general guide to help you determine how many slides you should have for the allotted time. Four minutes assumes there will be some dialogue with the audience. I've used this guide for years and it works. When I try to slip a few extra slides in, I usually get in a bind time-wise. If you're using additional visual aids or other deviation from the slides, of course, adjust as appropriate. Balance consistency and variety. Your slides should have a consistent background and color scheme (normally), but avoid being too predictable. Mix pictures, graphics, and words to retain interest. As I alluded to above, don't overuse bullet slides. In fact, your goal should be to eliminate them as much as possible. Illustrate your points instead of writing them. When you must use a bullet slide, add a relevant visual element to increase interest. Consider other visual aids besides slides. 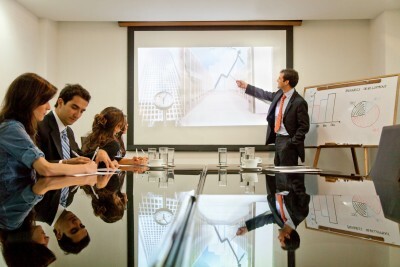 Use of PowerPoint has reached something of a saturation point, largely due to misuse and poor design. So it's worth using other options when you can, either alone or as a complement to your slides. These include posters, handouts, props, plan sets, etc. I encourage drawing things on a whiteboard or sketch pad for variety; it can make you look smarter than talking to a canned slide show. Don't make your choice arbitrarily. Design your presentation first and then decide what visual aids will work best. Don't allow your visuals to take center stage. To quote the title of a book by communication specialist Roger Ailes, you are the message. Avoid standing in the dark while your computer-generated images capture most of the attention. Don't turn and read from them either. Make judicious use of slide animations. Consider inserting a few plain transitional slides at key points to bring the focus back to you the speaker.